An elite range of technologically advanced skincare products that is specifically targeted to suit the needs of men. Lab Series Skincare offer products for every aspect of the body, from shampoos and body wash, to facial scrubs and moisturiser. Each advanced formulation is executed to a high performance, high specification degree, as developed by an eminent team of doctors, scientists and skincare specialists in the Lab Series Research Centre. Give your skin the very best with innovative textures and high-tech formulations, and experience healthy, comfortable and well-groomed hair and skin every day. With Lab Series, you're ready for action. For decades men have relied upon Lab Series to care for their skin with the utmost care and innovation. 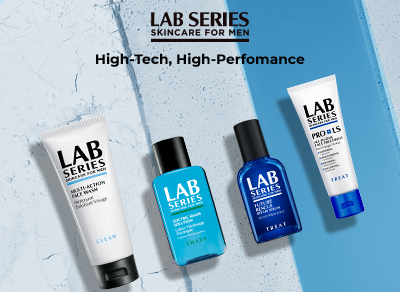 Today, Lab Series provides men with more tools than ever before to clean, shave and treat their skin to its maximum potential. The specific requirements of men's skin and its unique physiology inspire Lab Series, and have allowed them to streamline their collection for simple, effective products that suit any lifestyle. Their high-tech approach yields high-performance results, which is perfect for men on the go. From the Multi-Action Face Wash to the Triple Benefit Post Shave Remedy, the Ab Rescue Body Sculpture Gel to the Root Power Restorative Shampoo, Lab Series has the tools to perfectly address your skincare needs. From acne to ageing, Lab Series help men to understand exactly how to address their skincare needs, and provide the knowledge and the assurance to solve any problems.